Bobbie is on the Board of Directors of the Veterans of All Wars Museum in Chickamauga, GA. 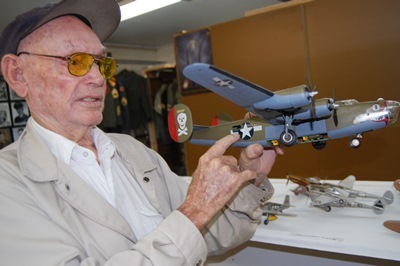 It was founded by Robert H. Honeycutt, a WWII veteran "The Eleventh Man" on a B-24 shot down over Austria. He was a POW in Stalag Luft IV and a survivor of the German Death March...destined to be gassed with the remaining POWs at Auschwitz before the war ended...he was liberated before that happened. The montage of him was donated to the museum by Heartland Therapeutic Programs in his memory at the depicted Grand Opening. 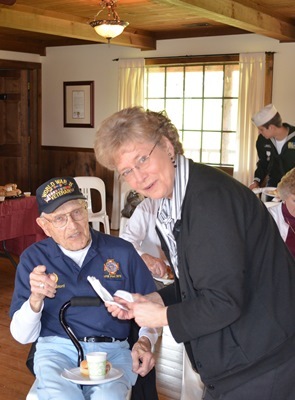 Bobbie was inducted into the Four Chaplains Legion of Honor in May 2013 for her charitable work. The group photo to the right is Bobbie's family minus her daughter, Whitney, who is a third year law student at Vermont Law School. Boyd Buchannan School in Chattanooga of the planting of Daffodils in their Children's Memorial Peace Garden in front of the school. Bobbie was instrumental in the funding of this project for the Chattanooga area by first obtaining funding from Heartland Therapeutic Programs to provide seed money...first $500 donation. Lowe's came through with many bulbs and digging equipment. The purpose of the many gardens (in excess of 100) in the Chattanooga and NW GA area are to memorialize all the children in the world who have lost their lives through violence and war. You see Bobbie digging, instructing a student how to dig (her grandson) and a group picture of the students and teachers. 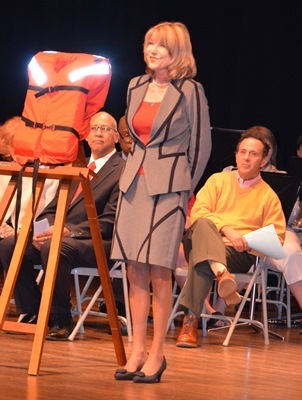 The project was initiated by Sylvia Wygoda. 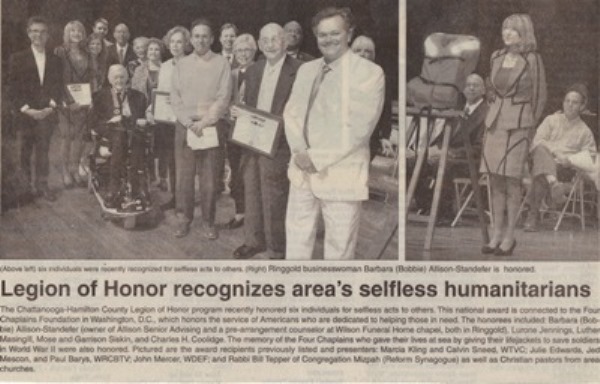 This is a news clip from the Catoosa County News about the Legion of Honor Award Ceremony. As part of this, Charles H. Coolidge, Medal of Honor recipient was also awarded the Legion of Honor. Members of the Heartland Board of Directors presenting a $10,000.00 check to Heidi Hoffecker of the Orange Grove Center in Chattanooga, TN. It pictures from L- R Linda Pettigrew, VP of Heartland; Dr. Rick Rader, Orange Grove Center (and co-founder of Heartland); Dale Harrison, President; Heidi Hoffecker, Orange Grove Center; and Bobbie Allison Standefer, Secretary of Heartland (and co-founder of Heartland). This annual event is sponsored by the Elder Abuse Task Team of the Lookout Mountain Judicial Circuit Domestic Violence Task Force which Bobbie is a member. Bobbie has been extremely active with this organization for at least four years and has been a sponsor, co-chair, and marketing person. Alvin C. York VA Medical Center Christmas Dinner event that the regional American Legion and VFW Posts sponsor annually. They provide a full Christmas dinner to the clients and staff at the hospital. Heartland has presented a $500 check each year for the past three years in support of this event. Also attending these events are Boy Scouts, members of Rolling Thunder and anyone else who wishes to participate. Wilson Funeral Homes has provided a bus each year, Leroy Wilson, owner of Wilson Funeral Homes drives the bus.